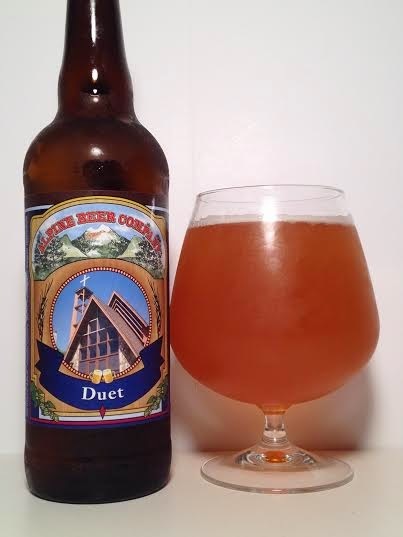 Another Alpine beer today as I dive into Duet. This American IPA is brewed with Amarillo & Simcoe hops "in harmony" as the bottle says. Duet pours a beautiful, hazy orange with a finger's worth of head which left some nice lacing on the glass. The aroma is fruity and bitter. It has a lot of that typical garlic I associate with West coast IPA's, but a huge hop bitterness balances that out. There's also a big orange peel presence as well. If you've ever had Ballast Point Sculpin, then this will immediately draw comparisons. This is nice and hoppy with tons of bitterness throughout. There is some big lemon notes on Duet and the orange is here along with a small garlic/onion feel that isn't strong enough to take control of your taste buds. The mouthfeel is nice and light and considering how bitter it is, it is actually going down easily. Duet doesn't break the mold of West Coast IPA's, but it is one of the more drinkable and refreshing ones I've had in recent memory. Incredibly bitter and smooth, Duet is an easy-drinking IPA that will please both the East and West Coast.